Hot water in traditional automatic horse waterers, tanks, or buckets, limit water consumption. Decreased water consumption results in more trips to the Vet and limited mental and body function. Animals have the same problem of proper water consumption with the standing water exposed to the icy frigid air. Because the source water for our units comes from a buried water line, the temperature of the water is consistent. In the winter the water is much warmer than standing water and in the summer the water is much cooler. Whether you are in the hot hill country of Texas or the frosty New York Adirondacks, Bar-Bar-A Horse Waterer Drinker gives your horses what they need- Clean, Fresh, Water at the right temperature- and all this without algae and without electricity. Enjoy fresh tasting water without all the algae that can grow in stagnant standing water. From 4 models to choose from you can customize to fit your situation. The Bar-Bar-A watering system bay be installed in barns or pastures. They are equally effective in both settings. The unit is versatile in that it may be installed in a fence line or between two stalls making it possible for horses on both sides of divide to access the water. Your horse requires a constant source of clean and fresh water. A horse’s body consists of approximately 70 percent water. Most experts agree that water is the most important element in a horse’s health. Feed, minerals, and vitamins are secondary to water. Your horse’s daily water consumption needs to equal the amount of water lost through urine and sweat in a 24 hour period. For an average sized horse that amounts to about 6-10 gallons per day. A quick test to see if your horse is getting enough water is to softly pinch the skin on the neck and turn the skin right or left. Time how long it takes for the skin to resume its former position. Anything less than 2 seconds means your horse is getting the proper amount of water. Another way to check this is to fold your horse’s top lip back and with your finger press down firmly on the gum. Use the two second rule to see how long it takes for the white made from the depression, to fill back in with pink. 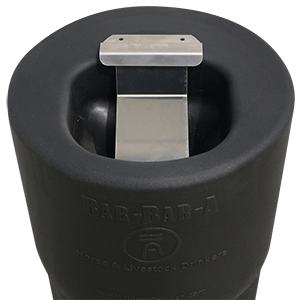 With the Bar-Bar-A automatic horse drinker your concern for proper water consumption can be alleviated. Installation automatic waterers – is uncomplicated and personal help is always a phone call away. When the lights go out Bar-Bar-A is still at work.